Target Corporation, of Minneapolis announced a voluntary recall of Chefmate 6-Speed Blenders because while in operation, the plastic pitcher can separate from the blade assembly, leaving the blade assembly in the base and exposing the rotating blades. This poses a laceration hazard to consumers. The recall involves all Chefmate 6-Speed Blenders, model BL-10. The model number is located on the bottom of the base. 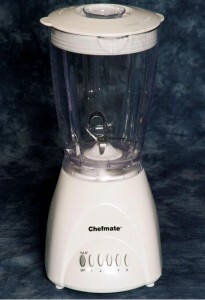 The blender consists of a six-inch tall, white electrical base with five, white speed-selector buttons labeled 1 through 5, one gray button labeled “Pulse/Off” and the word “Chefmate” in black letters on the front; a clear plastic pitcher with a handle with U.S. and metric volume measurement markings; a white plastic lid with a removable clear plastic lid stopper; and a white plastic blade assembly with two angled, stainless steel blades. The affected blenders were sold exclusively at: Target stores nationwide from September 2007 to February 2011 for about $14. Consumers should immediately stop using the blenders and return them to any Target store to receive a full refund. For additional information, contact Target Guest Relations at (800) 440-0680 between 7 a.m. and 6 p.m. CT Monday through Friday, or visit their website. Previous Post: « Del Taco: FREE Premium Shake on Your Birthday!